The House on the Hill is a melodic, blissfully appealing trio of rootsy rock songs, rife with dark lyrics that channel sadness and cautionary tales. England's the Hanging Stars recently added The House on the Hill, a triple single, to its recorded repertoire. Tinged with sadness, the tunes, which range from psychedelic retro rock, to folk, to country, offer listeners a nice variety in a short timespan. Crisply mixed and nicely produced, the sonic depth is unfettered and uncluttered, allowing each instrument (including the voice) plenty of air time. The first track, "The House on the Hill", features a sand-and-surf inspired clean guitar line, which leads quickly into a melodic, slightly twisted pop song. Inspired by a traditional folk tale (similar to the band's previous single, "Golden Vanity") this psychedelic tune superficially sounds rootsy and uptempo. Richard Olson's vocals are as melodic as the band's music: convincing and evanescent. The arrangement builds momentum wonderfully, culminating in a pedal steel interlude with a great snare-drum led buildup bridge to pop oblivion. Background vocals are faintly haunting. The lyrics, a stark counterpoint, evoke the portrait of a woman who drowned in the sea because her heart was broken. The video, directed by Paul Kelly, takes the limited-chroma, diplopic unreality a step further, with a violent stinger finale. A dark, cautionary tale, it's got jangly, blissful appeal, and a rewarding twist for an attentive listener: the juxtaposition that something's amiss. The track's subtle, subversive nature tugs on the ear and bends the mind, ever so closely. With a flair for fine Americana-informed tone and folky balladry, the band reveals its next tune. Delectably retro, "Endlessly Aimless" pairs a relaxed tempo with a pastoral, floating melody line. Rich and syncopated, the song moves along like one would, as if guided by a gentle breeze. As with "The House on the Hill", this track builds momentum naturally, with a multi-layered, synth-led bridge that blossoms into the final vocal verse. Lyrics are melancholy and depressive, a sharp contrast to both the lovely vocal melody and the instrumental accompaniment. The vibrant crescendo near the tune's ending sounds almost celebratory, which is a very odd pairing to accomplish, given the lyrical themes up to that point. Somehow, the Hanging Stars make this sound seamless. Featuring numerous buildups and teardowns, the ebb and flow of this song seems to underscore the rollercoaster of loneliness, but packages it so prettily that it takes a few listens to absorb. 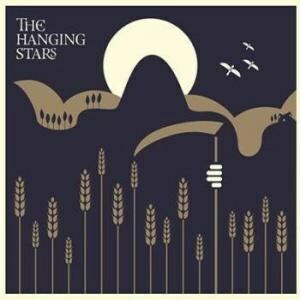 As the Hanging Stars are a five-piece ensemble, the tune naturally is much more involved and ambitious then a solo singer-songwriter might present it, with many layers of instrumentation, a lot of sonic depth, and a very nice mix. Delicious pedal steel and slide guitar work dot the piece, and busy snare drum work with a gentle touch compliments the arrangement. As the song fades out, fans wonder what is yet to come.